It started with a tweet about Glogster by Shelly Terrell . I liked this tool so much that I immediately created my own glogster called My Magic Wand a.k.a Web 2.0. On the very next day I introduced it to my students who loved it even more than I did and a new project was launched. 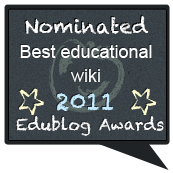 Three months later it was nominated for the Edublog Awards! I felt as if I had been nominated for an Oscar Award and I will never forget that December night when the winners were announced. At that time there were 10 participating schools in the project. A year later we were joined by another 8 schools and this year we have grown again - for the time being there are 29 schools from 6 continents with more than 500 students who have contributed to the project with their glogsters. There are more than 300 amazing glogsters that our members have created. Over the past year we have worked with Beetroote, whose travels and glogs have inspired all of us to create glogs that can be used as wonderful learning resources. If you want please vote for Greetings from the world on the Edublog Awards website. This year the voting process is slightly different: you can vote for us every single day! But please make sure to view all the other wonderful wikis, blogs and blog posts and let amazing educators and students from all over the world inspire and enthuse you.